Postcard to Mrs. R.B. Layton, San Fernando, Trinidad, B.W.I. 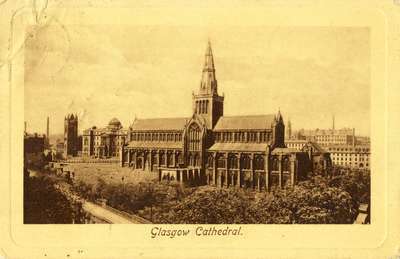 mailed from Glasgow, Scotland. This medieval cathedral, Church of Scotland, was consecrated in 1197 and survived the Reformation. "Many thanks for sending the paper with the account of the induction. It is nice to hear that you are settled now. I hope you are both well and liking your new home.